Allowing IT to create, manage, and deploy a single image to any endpoint. Centralized single image management for your company. Focus on software, not hardware. We manage drivers for you. Moving your users to Windows 10 is easier than you think. Deploy images to branch offices without costly infrastructure. Quickly reimage instead of time-consuming PC troubleshooting. Take a modern approach to legacy disk imaging software. SmartDeploy gives you the tools you need to achieve true hardware-independence. Streamline your image library and save hours by creating and maintaining one golden image that can be deployed to any endpoint model. Learn the basics in our 45-minute demo and you’re ready to go. Our foolproof process includes built-in best practices to help you achieve success from day one. We’ve got you covered whether novice or expert. It takes about 30 minutes to deploy an image from cold boot to Ctrl+Alt+Del with SmartDeploy. Most customers report a 50-80% time savings over their previous imaging solution after making the switch. We use modern file-based imaging instead of legacy sector-by-sector hard disk copies. In addition to the flexibility advantages, file-based images consolidate storage using deduplication and are serviceable offline. Get started in two simple steps. Platform Packs are downloadable driver packs created by SmartDeploy technicians for SmartDeploy customers. Each Platform Pack contains the drivers needed for a specific endpoint make, model and OS version. Nothing more, nothing less. 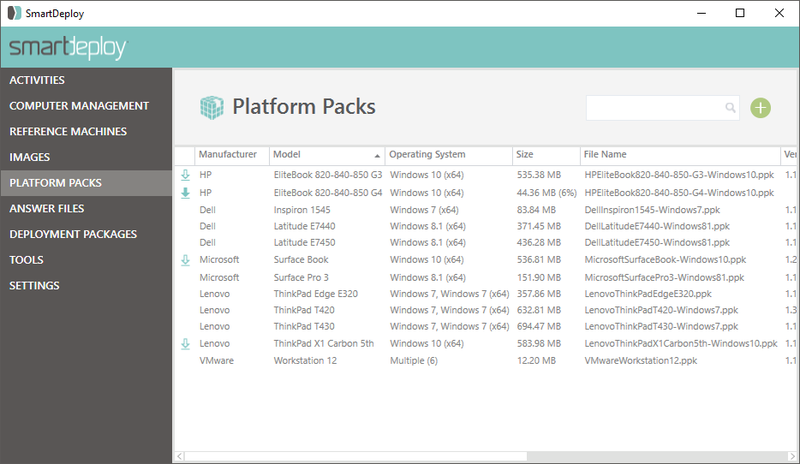 Our continually growing library includes over 1000 Platform Packs for business class devices. Our library includes models from more than 15 manufacturers including Dell, HP, Lenovo, and Microsoft. Full access to the Platform Pack library is included with your SmartDeploy support contract. From Windows 7 to Windows 8.1 to Windows 10 and every major version thereafter, you’ll manage every Windows version with the same simple process. SmartDeploy has out-of-box capability to migrate user data when migrating a computer to a new OS. That’s one less step for you to hassle with during your Windows migration project. As a best practice, we always recommend reimaging your computers to start your users from a clean, known state when moving to a new Windows version. We simplify large Windows migration projects by deploying faster, automatically handling drivers, and allowing you to deploy one golden image to every model. No costly infrastructure or complicated setup. Just install SmartDeploy and start deploying over your existing network. Our simple Answer File Wizard gathers the information needed to perform a completely unattended, remote installation. Leverage your Dropbox, OneDrive, or Google Drive cloud storage to deploy images to remote devices that aren’t on your network. Desktop support is a critical, and often painful, IT function. The poor reliability of traditional imaging processes can cause IT teams to fight through extensive PC troubleshooting. Rather than do battle with blue screens, device drivers, and updates, simply reimage the device with SmartDeploy and have your user back up and running in minutes. SmartDeploy enables organizations to provide first-call resolution of desktop support issues by making reimaging simple and highly reliable, reducing expensive employee downtime even when the user is remote. With SmartDeploy, productivity is returned to users in as little as 15 minutes after the reload process initiation. Take a modern approach to traditional disk cloning software. Our modular, layered architecture allows you to deploy one single image to any device, and gives you the best imaging and deployment experience with the highest endpoint performance. SmartDeploy maximizes flexibility by capturing a golden image from a VM. With disk cloning software, IT must keep a library of physical reference machines for image maintenance resulting in wasted budget and resources. To update images with SmartDeploy, simply start up the reference VM from anywhere, perform updates, and recapture the one golden image. With fewer images to manage, setting and keeping an update schedule is easily attainable.